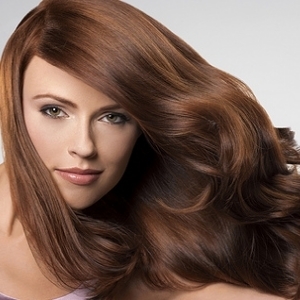 Most people try to get healthy hair by using hair care products and following hair care tips. Several treatments and tips focus on treating hair problems such as dry hair, split ends, damaged hair, and so on. However, these treatments and tips usually try to fix hair conditions after the conditions have occurred. One effective solution to help prevent these hair problems and promote healthy hair from the inside out is to eat foods and/or vitamins for healthy hair. Here are some of the vitamins, their benefits to hair, and common sources of them. – Vitamin A: Vitamin A helps produce healthy oil in the scalp. Too little oil leads to dry hair and scalp. Vitamin A can be found in dairy products, spinach, meat, green vegetables, broccoli, carrots, apricots, and peaches. – Vitamin B3 (Niacin): Vitamin B3 increases scalp circulation, transports oxygen to hair follicles, and stimulates hair growth. Common food sources of Niacin include dairy products, poultry, fish, lean meats, nuts, wheat germ, brewer’s yeast, and eggs. – Vitamin B5 (Pantothenic Acid): Vitamin B5 helps prevent premature gray hair and hair loss. Common sources of vitamin B5 are cauliflower, kale, broccoli, tomatoes, avocado, sweet potatoes, cheese, corn, egg yolks, liver, meats, peanuts, soybeans, brewer’s yeast, and wheat germ. – Vitamin B6: Vitamin B6 helps with healthy hair growth. It also helps the body produce melanin which gives the hair its color so it is effective in preventing gray hair. Foods rich in vitamin B6 are Brewer’s yeast, liver, whole grain, vegetables, organ meats, and egg yolk. – Vitamin B7 (Biotin): There are several beauty and health benefits of biotin. Hair benefits of this vitamin include gray hair and hair loss preventions. Sources of biotin are whole grains, egg yolks, liver, rice, brewer’s yeast, and milk. – Vitamin B12: Vitamin B12 helps the regrowth of hair. This vitamin is essential for red blood cells to carry oxygen from the lungs to hair follicles. Lack of vitamin B12 prevents the follicles from receiving proper nutrients, causing slow hair growth and hair loss. Vitamin B12 is found in meat and dairy products. Vegetarians can get this vitamin from supplement and fortified foods. – Vitamin C: Vitamin C improves the absorption of iron and other nutrients necessary for healthy hair growth. Vitamin C deficiency can lead to hair loss, split ends, and hair breakage. Foods high in vitamin C include citrus fruits, strawberries, kiwi, cantaloupe, pineapple, tomatoes, green peppers, and dark green vegetables. – Vitamin E: Vitamin E is an antioxidant that improves your scalp’s circulation which in turn increases oxygen and nutrients flow to the hair follicles. This helps stimulate faster hair growth. Common sources of vitamin E include leafy green vegetables, nuts, seeds, dried beans, soybeans, and cold-pressed vegetable oils. – Inositol: This nutrient helps in minimizing gray hair and restoring the natural hair color. It also keeps hair follicles healthy. Inositol can be found in whole grains, brewer’s yeast, liver and citrus fruits. – Zinc: Zinc helps with the production of healthy oil on the scalp. It also assists with the absorption of various vitamins. Zinc stimulates hair growth by enhancing immune function. Sources of Zinc are yeast, egg yolks, meat, liver, oysters, wheat germ, nuts, pumpkin seeds, soy, shrimp, and mussels. Thanks a ton tried a lot and has resulted immense pleasure and also glorious hair. Across every single hair product I used by eating food you suggested has helped me to grow and reduce my hair fall. Thanks so much!! I request other people reading this to believe this true effect of nature rather than the fast hair products. Thank you megastellla! Glad to hear that this post helps! Can you please suggest a natural recipe for shampoo?